More tulips, a photo by PhotoPuddle on Flickr. Tomorrow is an inset day at my daughter's school so that means half term starts here! Woohoo. She is still loving school and I like doing the school run but I think we are both in need of some quality mummy and daughter time. I am also so looking forward to not setting the alarm for a few days. And here is another flowery photo by me. 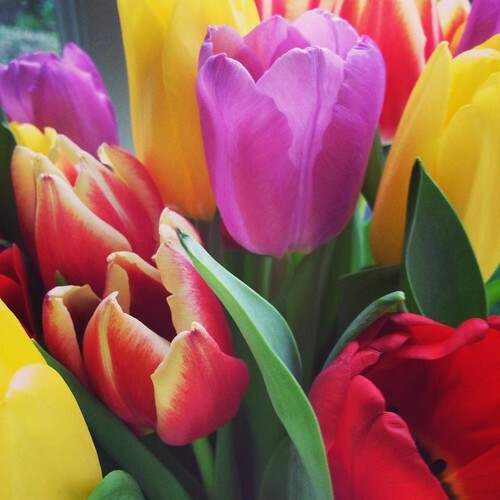 I know there have been a lot of tulips on here recently but it's my blog and I'll post photographs of tulips if I want to! This is my favourite of the many tulip photos I have taken this week. Happy half term to all of you with a school holiday coming up!